Blend until incorporated, if the shake is too thick add more milk. Line 8 mini-flares on a tray and pour the Nutella™ shake into each individual glass. If you're using straws, cut them in half so they will fit each flare. 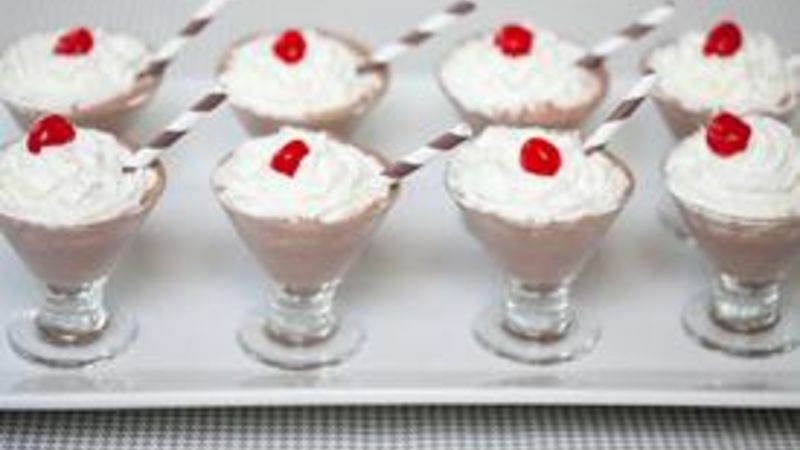 Garnish the shakes with whipped cream, a cherry and a straw! Everyone loves Nutella, right!? Really, I don’t think I’ve ever met anyone who dislikes it. Its creamy, peanut butter-like texture and super chocolaty hazelnut flavor are irresistible! My first experience with Nutella was in Paris. I desperately wanted a chocolate crêpe, but the café only served Nutella. I figured when in Paris, do as the Parisians do! And wow—it blew my palate away! I knew I would be stopping in many more French cafes for Nutella crêpes on my trip. Not knowing if you could buy it in the United States at the time, I purchased two containers to take home with me. I shared one with my family, but the other one was all for myself! Since Nutella is pretty versatile, I knew it would taste amazing in a shake! Then I thought, if you’re throwing a party, why not make Mini Nutella Shakes to serve to all of your guests? Using a simple and classic shake recipe and half of a cup of Nutella, the Mini Nutella Shake was born—and boy is it good! Vanilla ice cream and Nutella are your main ingredients. Blend with ice in a blender and pour the mixture into mini flare glasses. Can't get enough Nutella? Try Nutella Pop Tarts and Nutella Ravioli Cookies.